EVERYONE NEEDS TO STOP USING WATER FROM THE TAP, INCLUDING FLUSHING TOILETS AND SHOWERING. THIS IS A CRITICAL SITUATION. 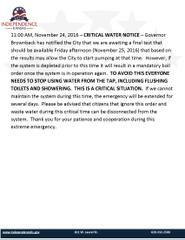 11:00 AM, November 24, 2016 – CRITICAL WATER NOTICE – Governor Brownback has notified the City that we are awaiting a final test that should be available Friday afternoon (November 25, 2016) that based on the results may allow the City to start pumping at that time. However, if the system is depleted prior to this time it will result in a mandatory boil order once the system is in operation again. TO AVOID THIS EVERYONE NEEDS TO STOP USING WATER FROM THE TAP, INCLUDING FLUSHING TOILETS AND SHOWERING. THIS IS A CRITICAL SITUATION. If we cannot maintain the system during this time, the emergency will be extended for several days. Please be advised that citizens that ignore this order and waste water during this critical time can be disconnected from the system. Thank you for your patience and cooperation during this extreme emergency. 9:00 AM, November 24, 2016 – City crews were able to connect to a water source from Big Hill Lake last night, however, even with this connection our system still lost water over night as this connection can only replace a small percentage of water that is lost. Therefore, it is extremely important that citizens do not use tap water and do not flush their toilets if at all possible. This affects all City of Independence, Kansas residents; Montgomery County Rural Water Districts #1, #4 & #8; and Montgomery Consolidated Rural Water District #1. We have non-potable and bottled water available at two locations at City Hall at 811 W. Laurel and ICC West at 2600 W. Main Street. Please bring your own containers for the non-potable water that can be utilized for flushing your toilet, however, do not consume it. City crews worked through the night and City Hall is open today. If you have transportation please check on your homebound neighbors to see if you can assist in providing water for them. If you have questions, wish to volunteer or if you are homebound and have no way to obtain water at one of the distribution points please call 620-332-2500. Do not call 911 unless you have an emergency. Again, it is extremely important that everyone cooperate and do not waste what little water the system has to avoid further extending this emergency for everyone. Thank you for your patience and cooperation during this emergency.